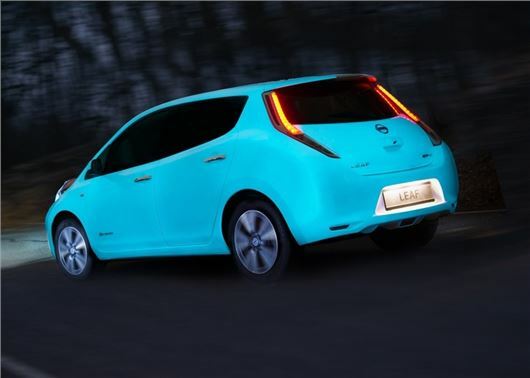 Nissan has become the first car manufacturer to apply glow-in-the-dark paint to a production car. The ultra-violent Leaf uses a spray-applied coating, which absorbs UV energy during the day. According to Nissan, the paint will glow for up to 10 hours after the sun goes down. Although glow-in-the-dark car wraps have been available for a number of years, it’s believed this is the first time a manufacturer has directly applied ultraviolet-energised paint to one of its production vehicles. The special coating, called Starpath, is the brainchild of British inventor Hamish Scott and uses a rare natural earth product called Strontium Aluminate, which is solid, odourless and chemically and biologically inert. If made commercially available, the paint would glow for 25 years. Nissan hasn't confirmed any plans to offer the paint on production cars yet, although more details could be revealed at the forthcoming Geneva Motor Show. To see the glow-in-the-dark Nissan Leaf in action, click the link below.